Today I managed to run AOT compilation in existing Angular 2 application. Change all "template: require(path)" to "templateUrl: path". Require function is not available in AOT compilation process. Had to add angular2-typescript-loader to handle ts files in webpack (loaders: isProd ? '@ngtools/webpack' : ["awesome-typescript-loader", 'angular2-template-loader']). It handles templateUrl in components. Newest versions of libraries (ts 2.2 and webpack 2.2.0-rc.3) had documented issues with whole mechanism, so I had some fun searching for solutions. 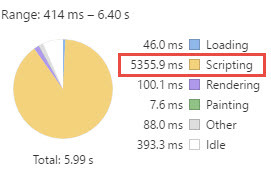 Scripting took 3 seconds less and it is more than visible. Difference is huge. 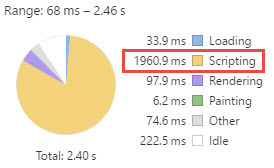 Scripts are now 600KB bigger, but they load once, so it is not a huge problem. AOT compilation is nice feature of Angular 2.